Refrigerant leak in late model Ford Explorer? Check under the accumulator blanket! Refrigerant leak in late model Ford Explorer? Check under the accumulator blanket! Are customers complaining of gradual decreased cooling on late model Explorers? Are you suffering occurrences in Explorers of continuing refrigerant loss? If so, check out the accumulator, it may be that external rust is setting in. Above and below (click thumbnails for a larger image): This is a 4 year old Ford Explorer accumulator! Peel away the thermal insulation and the rusting is rampant. Plus, the vehicle lives in a desert. What must be happening to these vehicles in Minneapolis? 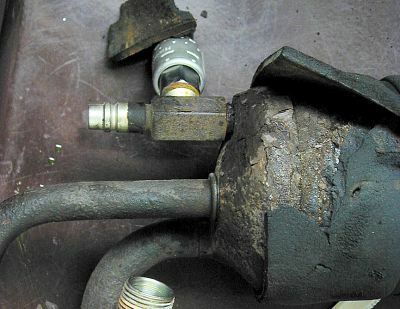 While it’s normally a very unusual problem, we've had 5 of these in the shop this year already, all in 1997 Ford Explorers with the V8 5.0-liter engine. For now, with a little research, it appears, that this problem is limited to 1996-98 V8 Explorers. 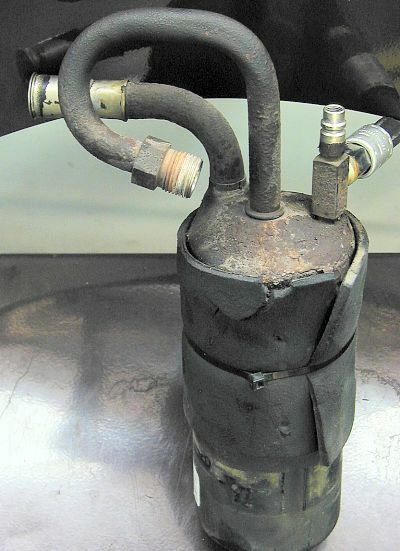 Aside from desiccant bag rupture (and dispersion throughout the system), one would not suspect this problem because accumulator failures are so rare. We’ve never experienced any such failure, especially in such new vehicles. The accumulator has a thermal wrap-around blanket and evidently excess moisture is trapped between it and the all-steel accumulator. Removing it easily exposes the rust. Actually, on some of them, the rust is so bad you can see it without having to peel back the blanket. It’s incredible! So what's up? Another major Ford screw up? Hmmm…I see that Ford must have caught it because they have deleted the wrap in 1999-2001 Explorers. Note that GM has the blanket too, but uses all-aluminum accumulators. 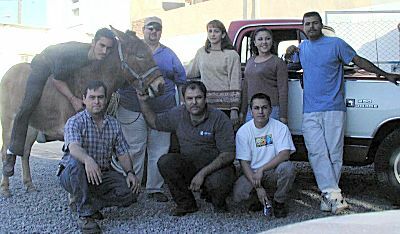 Above: Ignacio “Nacho” Corella (lower left) and the crew at CEKSA Autoclimas, Hermosillo, Mexico. Air conditioning is a year-’round business at their shop. Editor: Nacho Corella is the owner of CEKSA Autoclimas, an automotive repair facility in Hermosillo, Mexico. Given their year around warm climate, they specialize in air conditioning service. Nacho is a daily contributor to the Bulletin Board at www.aircondition.com. He helps a/c technicians and DIYers overcome both the obvious and the most difficult of a/c service problems. Phone: 526-210-3501 (from the US, don’t forget the 011); Toll-free in Mexico: 800-222-AIRE; Fax: 526-210-1607.